The best professional automatic high-speed laminator whose performance and the functions are excellent. This is adjustable to automatic PP processing laminator either on one side or on both sides by changing the cutter or the feeder. (A combination of each function is adjustable as well.) Automatic PP processing in different positions on both sides of a Z folded open postcard is possible. The side slitter is a simple structure using a blade that makes it direct with easy operation. Also curling on an edge is prevented by having an axis. 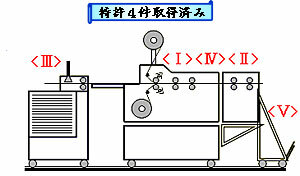 The pull roller is self-pressing type. It is a highly qualified laminator with slip and pressure balance between rolls in the front and the rear also great maintenance skill. Clearance setting (up to 9mm) is possible for heat roller. Easy removable pull roll, also board lami processing is possible.